In a large zip-top freezer bag, add the flour, cheese powder, chili powder, black pepper, and salt. Shake well to combine. Add the chicken and shake until well coated. Chill in the refrigerator for a minimum of 10 minutes. Preheat the oven to 425 degrees F. Line a rimmed baking sheet with foil, and fit with a wire rack. Spray well with cooking spray. Take 2 wide-mouthed shallow bowls. In one, beat the eggs with the milk. Place the crushed Doritos in the second. Working with one strip at a time, dip the chicken in the egg wash, allowing the excess to drip off. 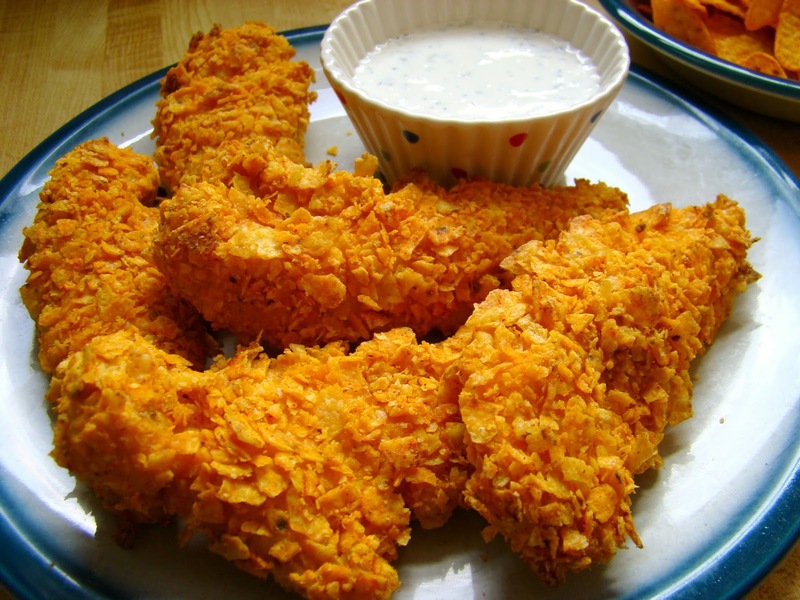 Toss in the crushed Doritos, pressing the chips into the chicken to make sure it is well coated. Place the strips evenly on the prepared wire rack and spray lightly with cooking spray. Bake for 10-12 minutes, until the chicken is cooked through (an internal temperature of 165 degrees F).